The concept of Distributed Positioning (DP), previously formulated for robots [B2: 14,15,19,20; in Sec. 5], was applied to resolve the redundancy problem in handwriting. The DP concept consists in separating the original end-effector motion to slow global and fast local motion and assigning these components to robot joints according to their dynamic capabilities: slow component to massive basic configuration and fast component to light redundancy. 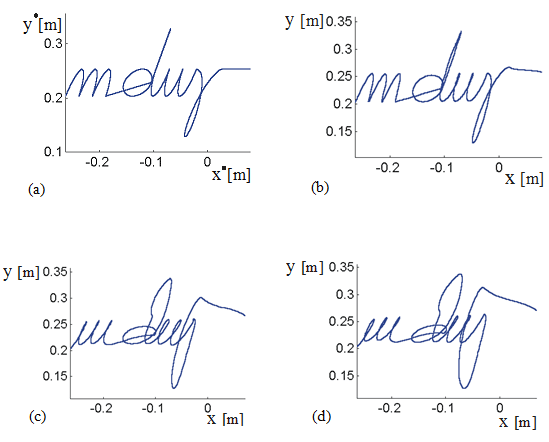 In handwriting, the relationship between finger involvement, legibility, and letter inclination was found and the existence of an optimal inclination for a prescribed legibility was proved. Degeneration of handwriting with the progress of fatigue was shown. Robotic assistance to correcting the handwriting disorders was seen as the final target. Figs. 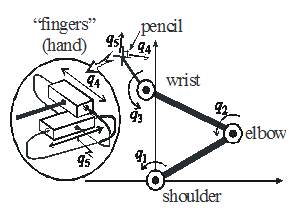 3.8a and 3.8b show the structure of the arm-hand complex used in the simulation experiment: shoulder, elbow, wrist, and two translations emulating the synergetic motion of fingers. Fig. 3.9 presents the relationship between the finger involvement (IKI), inclination of writing (α), and legibility (Le). 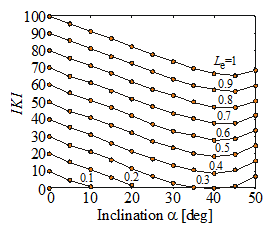 Minimum (optimum) can be observed for each curve (i.e. for each level of legibility). 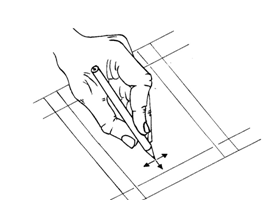 Optimal inclination minimizes the finger involvement (thus delaying the fatigue and enabling longer writing). Fig. 3.10 shows how handwriting gradually degenerates with the progress of fatigue. Fig. 3.9 Relationship between the finger involvement (IKI), inclination of writing (α), and legibility (Le).